Thanks for playing with us during the past two weeks. I may be biased (haha! )but I think we have the most creative participants ever! I loved the angled design! It was a wonderful opportunity to get that washi tape out of the drawer, wasn't it? 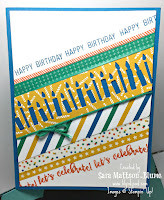 Sara created a really vibrant birthday card using a variety of paper, washi tape, lively sentiments and a birthday candle border punch! The Design Team just wanted to put on their fancy hats and par-tay when they saw this one! And from colourful to an epic neutral design with definite masculine appeal. LeAnne built on the black and silver theme to create a birthday card with a bias! The Design Team loved the crisp look of the black, white and silver and the special details, especially the "wire" anchored by the "bolt"! Congratulations to our two winners, and thanks to all of you who took the time to enter your creations! I hope you'll check out our new challenge tomorrow and please share it with your crafty friends! Our winners can pick up their badges on this page and sport them proudly on their blogs or sites. Thanks so much for the pick, and congrats to Sara for her fun card too! Awwww, thanks! The sketch came to me at the perfect time!